Montana’s poultry industry expanded significantly under Cushman’s guidance. 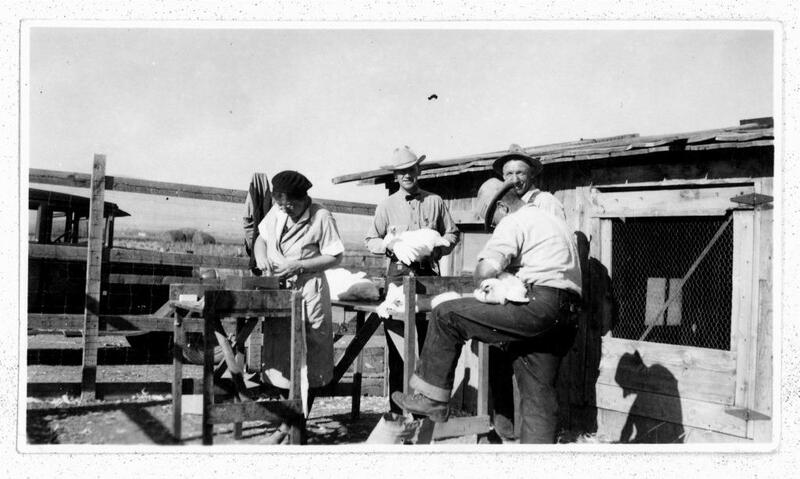 Prior to Cushman’s tenure as state poultry specialist, individual poultry growers worked independently, selling birds locally for whatever price they could get. In the 1920s, Cushman helped to form the nation’s first egg and turkey wholesale cooperatives, enabling Montana poultry growers to negotiate top prices. As the first poultry grader for the newly formed Northwest Turkey Federation, Cushman secured nationwide markets for Montana’s premium quality “Norbest” turkeys, making Montana’s turkey industry the most profitable in the nation during the Great Depression. Cushman regularly worked six and a half days a week, even after the legislature slashed the Extension Service’s budget during the 1930s. Much of her time was spent traveling, often by train, to meet with poultry growers. Between January and August of 1942, Montana’s poultry specialist logged over ten thousand miles—a distance she repeated year after year. Harriette Cushman avidly promoted poultry production through 4-H, publishing this 1945 manual, working with students, and sponsoring Montana’s best young poultry producers so they could attend national poultry conventions to learn from industry specialists. 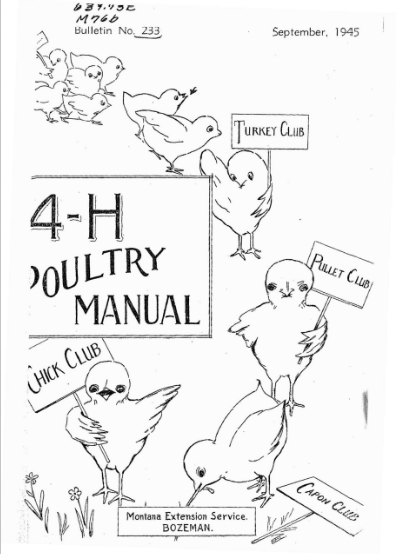 Cover of the 4-H Poultry Manual. Click through to read the entire manual. Bulletin (Montana Extension Service in Agriculture and Home Economics), Bozeman, 1945. Cushman inspired many new poultry growers in Montana. She introduced poultry production into Montana’s 4-H clubs, teaching youngsters how to raise exceptional flocks, grade eggs, and judge poultry. She particularly liked working on Montana’s Indian reservations, where profound poverty and lack of economic opportunity were most persistent and where poultry raising made tangible positive impacts. Cushman was deeply pleased when the Blackfeet, in gratitude, made her an honorary tribal member. Despite her own small income, Harriette Cushman regularly sent her mother money to alleviate her parents’ financial hardships. Her generosity extended beyond her immediate family, however, and she devoted much of her life to the betterment of her community. In 1948, she helped found the Montana Institute for the Arts to promote the arts throughout the state. 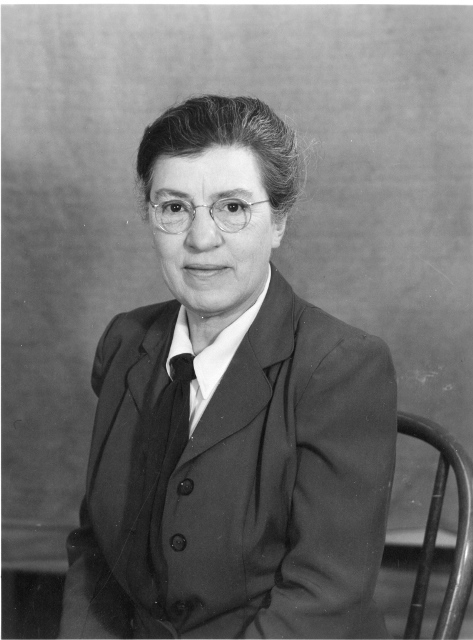 She also actively supported Montana’s libraries and the development of the McGill Museum (now the Museum of the Rockies), founded by Bozeman physician Dr. Caroline McGill in 1957. After retiring in 1954, Cushman devoted herself to promoting the success of Indian students at Montana State University. In 1969, nine years before her death in 1978, Cushman sent out six hundred handwritten invitations to her own post-life celebration and asked her many friends to contribute to the Indian Center in lieu of mourning. She willed her estate to the university, providing funds for both the Indian Center and a scholarship for outstanding American Indian students. “Bozeman Woman Throws Party After She Died.” Independent Record, Helena, August 19, 1978, 6. Burlingame, Merrill G. The Montana Cooperative Extension Service, 1893-1974. Bozeman: Montana State University, 1984. Cushman, Harriette. “4-H Poultry Manual.” Bulletin of the Montana Extension Service in Agriculture and Home Economics 233 (September 1945). _________. Harriette Cushman Extension Service Records, 1898-1975. Accession 75040. Special Collections, Montana State University Library, Bozeman. _________. Harriette Eliza Cushman Papers, 1893-1978. Coll 1253. Special Collections, Montana State University Library, Bozeman. _________. Vertical File. Montana Historical Society Research Archives, Helena. I went hiking with Harriette in 1960 when she was an retired elderly woman. She outhiked everyone else and had to “wait up” for us over and over. She always wore a denim dress. She convinced the Dean of Women not to expel me from school for staying out of the dorm overnight. She was adopted by Julia Wades In The Water, a prominent Blackfoot woman, and stayed in her tipi. She sold jewelry to support the Native Americans on the Rocky Boy Reservation some of which I still have. She made buffalo berry wine with her good friend Verne Dusenberry. She would buy a case of eggs directly from a farmer and cover each egg with a preservative so she could keep them in the basement without refrigeration. This enabled her to use AAA eggs which can’t be bought at the store. What great memories. Thanks for sharing!